Imagine those handy orange arrows as stopovers on my account. 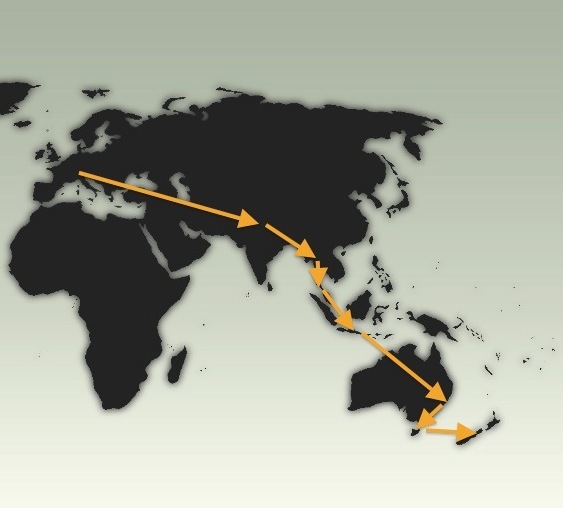 And for those of you how can’t read maps, try some nouns: Nepal, Thailand, Singapore, Australia / Tasmania, New freaking Zealand. Still not excited? I am! By the way, for some unknown reasons (probably to create the possibility of increasing my fellow readership from three to five readers) I decided to start blogging in English. Word! Trip Start: real soon, day after tomorrow. Trip End: May. May-be. Maybe? I will try to update this blog from time to time to let you know that I’m still (somewhat) alive, maybe even share some impressions; However, updating this blog will not be a priority (manta rays and hammocks are), so the update intervals may become somewhat irregular. But who cares, anyway? And now, with all respect: Peace out! geiler blog s1m, wie du dich zu nennen pflegst. :) aber sag mal was machst du denn in neuseeland?? danke fuer die blumen; naja, was macht man wohl so in Neuseeland, hmm? mal nachdenken, weiss ich auch noch nicht so genau, aber ich bin positiv gestimmt, dass mir da schon noch was einfaellt. notfalls bleibt mir immer noch ein buch zu lesen; oder so. Nice, how much would a trek like that cost? I’ll save for next time. no idea; but i’m about to find out the hard way.